Northern Light's goal in providing Millie is to give you at-a-glance market and competitive intelligence on a variety of industries. The heart of Millie is the presentation of immediately useful information on industry dashboards, so browse through them. There you will find featured stories, continuously updated news content, and links to additional topics. Also, we hate legal stuff, but the lawyers make us do it, so be sure to read the user agreement below at the bottom of this page. 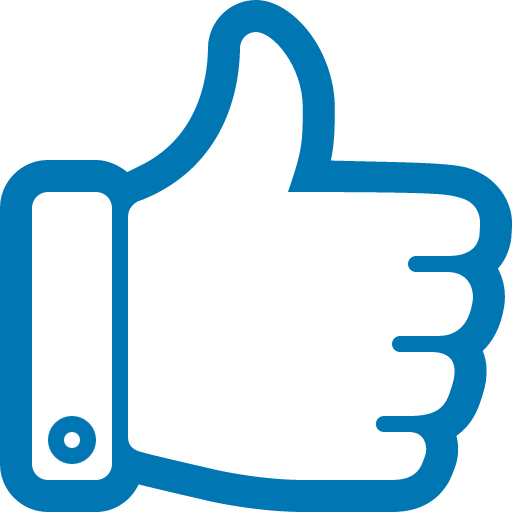 But after that, we hope you have a blast using the site and find that Millie is the most helpful and knowledgeable person on your market intelligence staff. To see a quick video about Millie, click here. To get started with a dashboard, use the dashboard menu in the upper left hand corner. 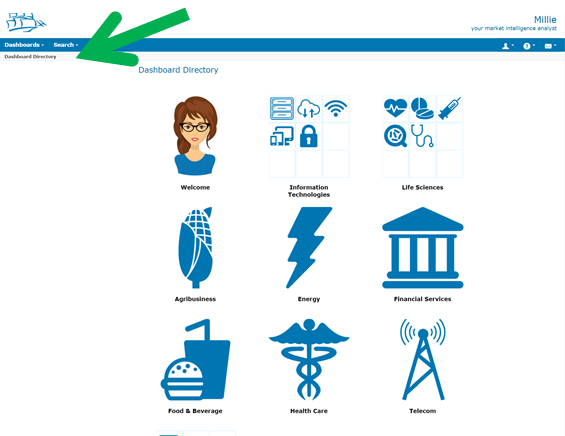 If this is your first time, begin by selecting "Dashboards" and then "Dashboards Directory." As you use dashboards, you will see that the ones you have looked at will show up in the dropdown menu under "Recent Dashboards." While looking at a dashboard, you can favorite it by clicking on the "star" icon beside its name at the top of the center column and that dashboard will be at the top of the list when you come into Millie. You can also search our business news feeds for content on topics not already on one of Millie's dashboards. The search runs against Northern Light Business News, a collection of 40,000 news stories a day from industry and technology news sites, with a few local newspapers thrown in for hometown business news. You can find different industry news search collections in the dropdown menu labeled "search." Pick your industry, enter a search term, and click on the search button. Note, the only difference in the search results by industry will be in the text analytics on the left hand column beside your search results, so be sure to check the analytics out. Whenever you see a search result on Millie, browse through the concept text analytics on the left hand side. The concepts listed are found in the stories on your search result. You can refine your search just by clicking on the concept name. Also, use the "more" link in the concept area to see an automated trend analysis of the concepts of interest. Millie is still under construction and you are using an early alpha version. We would love to receive your feedback and suggestions, so let us know what you think by using the contact form that you can find by clicking on the "envelope" icon in the upper right hand corner of this page. Given we are still working on Millie, you may see anomalous behavior, and things come and go from time to time. If you see an outright error, let us know! By using or registering for use of the Millie search portal you are agreeing to this User Agreement: Northern Light Group LLC and its subsidiaries and affiliates (“Northern Light”) make no guarantee, representations, or warranties, express or implied, as to the level of performance or to any benefit that you can expect to result from use of the Millie search portal. Northern Light will not be responsible for interruptions or shortfalls in your business due to errors or flaws in Millie. Further, any and all software, documents, data, technology, services, intellectual constructs, or other items accessible in Millie are provided "as is" without warranty of any kind. Northern Light does not warrant the accuracy, completeness, or fitness for any purpose of any third-party content included in the Millie search portal including but not limited to any content indexed by Northern Light or linked to from Web sources, syndicated research and news providers, government content repositories, or social media feeds. Northern Light hereby disclaims all express or implied warranties regarding any services provided hereunder or any portion thereof, including but not limited to, implied warranties of merchantability or fitness for a particular purpose, implied warranty arising from course of performance, course of dealing or usage of trade, and any implied warranty of non-infringement. This provision supersedes all communications and agreements in any form, including statements that imply contrary provisions concerning expected performance of the Millie search portal or any expectation of benefit from them. Like Millie? Learn about SinglePoint for your enterprise.